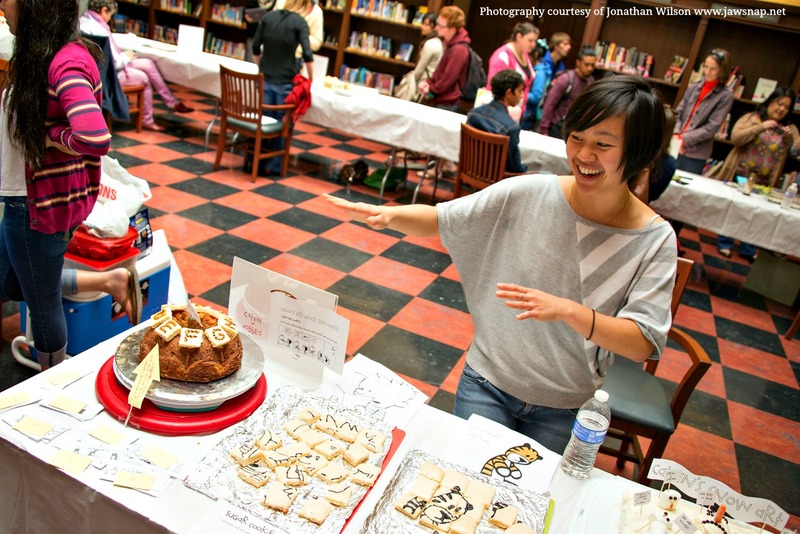 The annual Edible Book Festival! Now you can have your cake <–yeah you can still have your cake, and book, and eat them both. And if you think the concept of an ‘edible book’ sounds silly, you can come and eat your words, too. Heh. As an English grad student and avid fan of all things literature, I bet it’s a total shocker that I absolutely adore this event. I’m pretty sure if this event was a hunky-dory man, we’d be in a serious relationship right now. Once every 365-ish days, I weep with joy over this festival. I am not joking joking. Sort of. Lots of the beautiful photos you see here were taken by Jonathan Wilson, one among many of the very talented library staff who helped host this stellar event! And of course, we had a whole panel of talented library folks, as well as judges, here to make the festival a grand success (more on that in a few moments). But before I start waxing way poetic about some of the stunning entries I had the pleasure of seeing last week, let me explain how this event works. 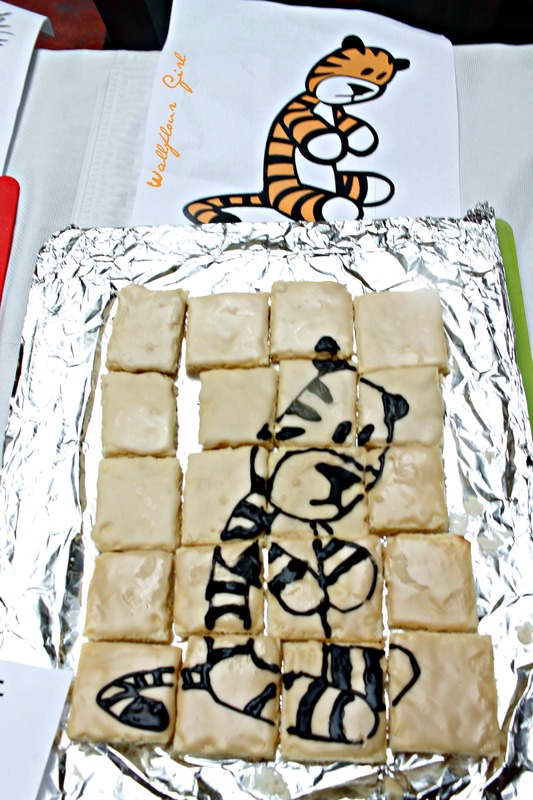 Because Edible Books–sounds pretty intriguing, right? The History: This annual event was started in 2000 by Judith A. Hoffberg and Beatrice Coron. 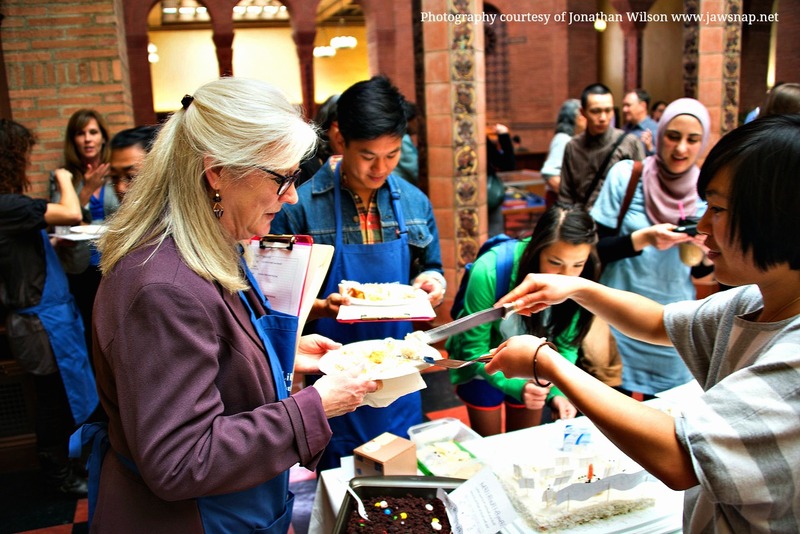 It’s basically what it sounds like: it’s a celebration of books, and more specifically it’s a time for all participants–bakers, chefs, and eaters alike–to celebrate the wonderful world of literature-meets-taste-buds. 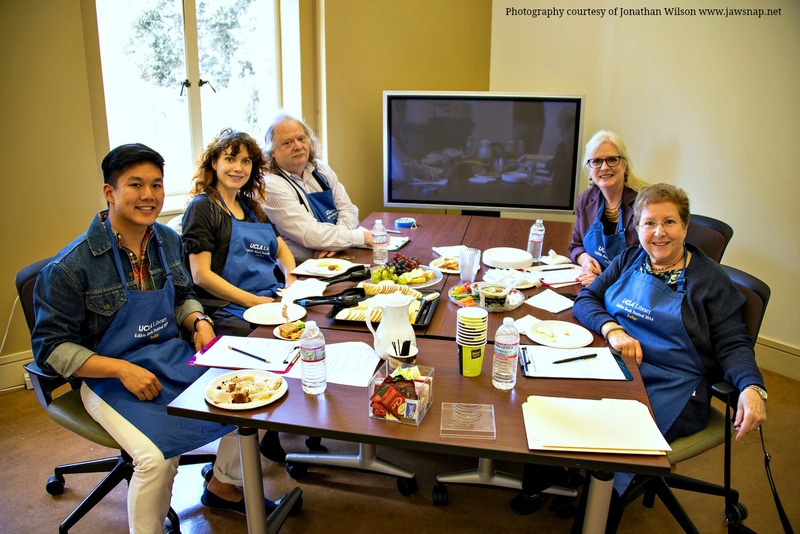 Leading up to the day of the event, entrants devote their time and energy to creating food-based masterpieces that are inspired by a literary text. The possibilities are quite virtually endless: try taking all the books in the world….and then multiply the possibilities by a gigglepoodle. 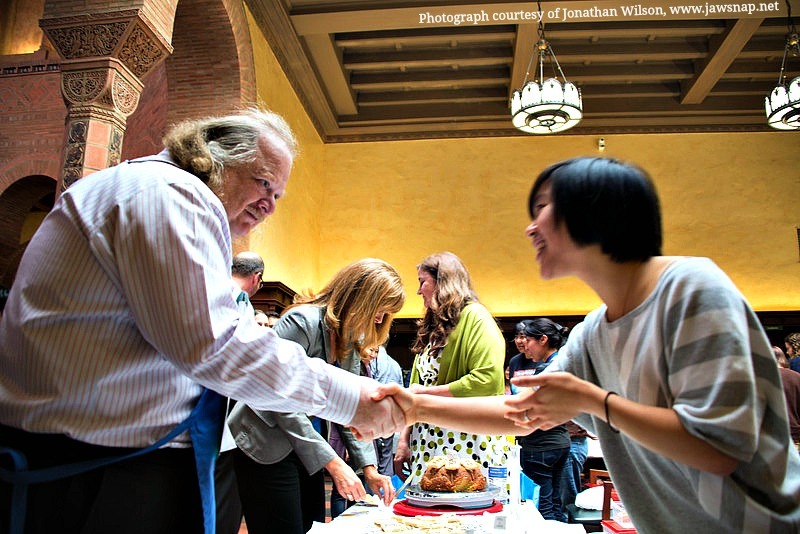 On the day of the event, entrants bring their edible masterpieces to the masses–that is, to the hungry people of UCLA. At our campus’s specific celebration, we set up in a huge library room called the Rotunda, which is aesthetically amazing and just gorgeous to the Maximus Awesomus. 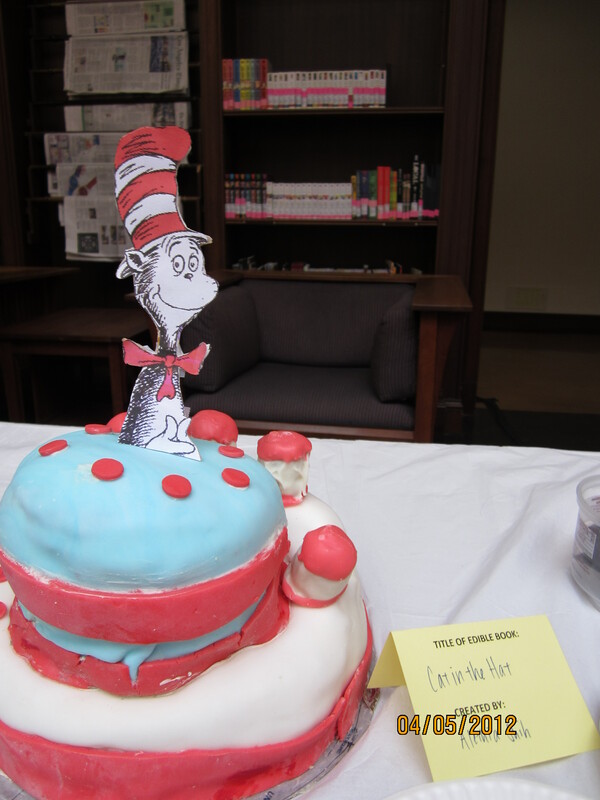 Pictured above is the topsy-turvy six-layer Cat in the Hat cake I entered in 2012. I still love the concept and can fondly remember just how many hours I spent planning, drawing, buying, re-planning, baking, and then working with and decorating this cake! As someone who identifies as a children’s literature researcher by day, big bad bold baker by night, books + cakes = a total sweet spot, and I was amazed to discover how many half-baked ideas I suddenly wanted to try throwing in the oven. 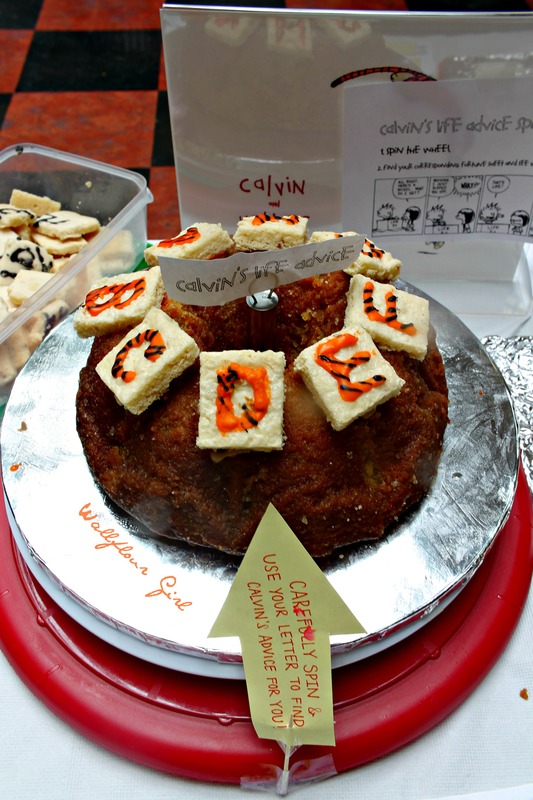 And that’s how this whimsical, comical, and somewhat grotesque Calvin-ball inspired cake came to be. By being impossible. Are you guys familiar with Calvin and Hobbes? 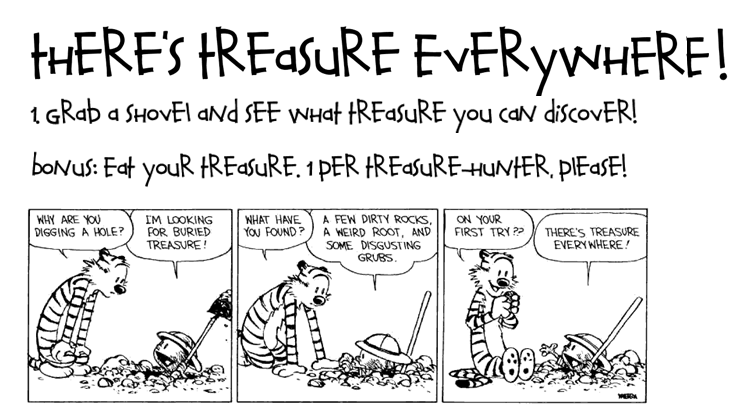 I grew up with Bill Watterson’s comics on lazy Sunday afternoons when I would lie on my stomach in the patch of sunlight streaming through the living room window and read about the six-year old kid philosopher and his stuffed tiger, Hobbes. Like every Calvin reader, I wanted a Hobbes of my own. I desperately needed one. 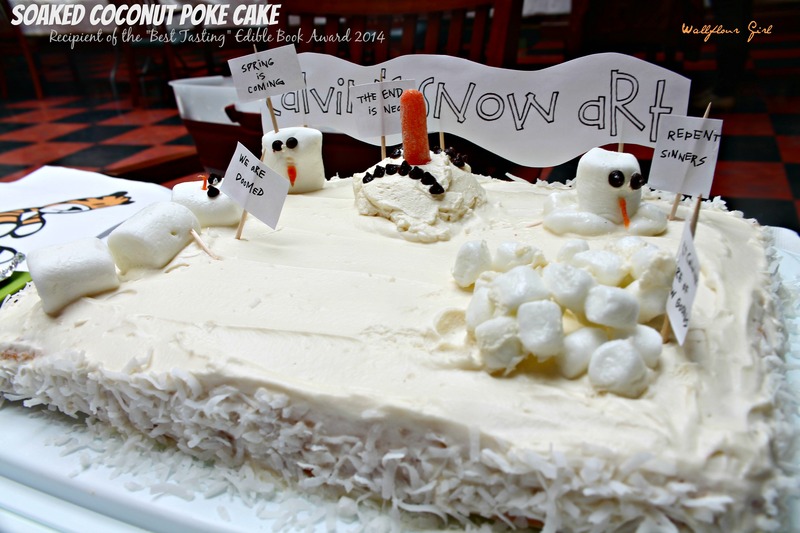 The Doomed Snowman Sculpture Garden pictured above, made of my favorite coconut poke cake recipe with an airy whipped butter-and-milk cream frosting, offers a nostalgic tribute to my very favorite comic strip of all time. 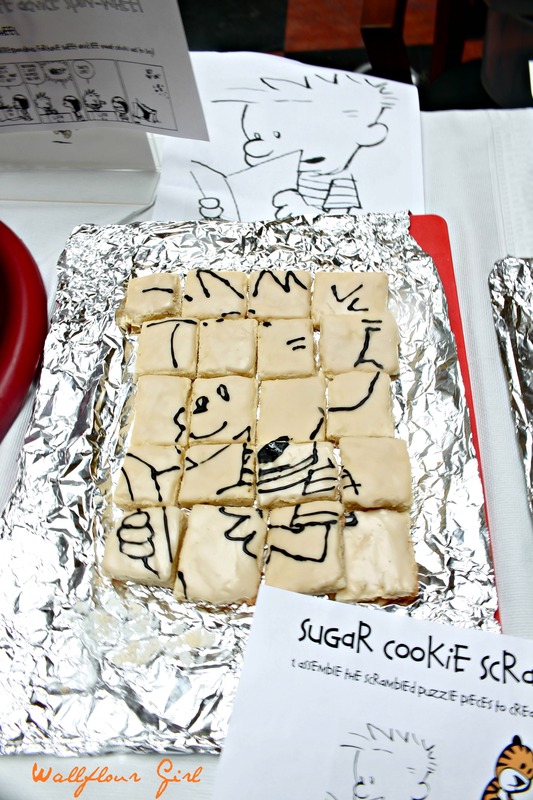 The Story Behind This Calvin and Hobbes Exhibit: Having participated in the festival two years in a row, I had seen plenty of gorgeous towering cakes and fondant molds, cupcake displays and wonderful buttercream transfers. As a children’s literature researcher who has been dabbling in visual media lately, I knew right away I wanted to do something different by using a comic book–because what better book format could there be for showcasing visual eats than the graphic novel? From there, my thoughts immediately turned to my favorite dynamic duo: Calvin & Hobbes. In the spirit of Calvin, it just made sense to make my display interactive–and with the notorious game Calvin-Ball as my inspiration (the only rule is that you can’t have the same rules twice! ), I decided to transform ‘food’ into a series of exciting, participation-intensive food adventures. 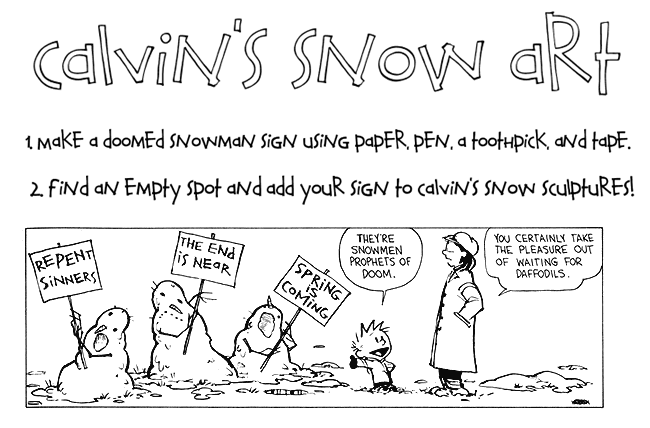 If you’ve never read Calvin: a) you really need to (I’d recommend going to your local bookstore and supporting the author by buying a copy, but in a temporary pinch you can probably find some strips online), and b) you’re in for a treat. If you have read Calvin: a) I think we could be BFFL’s, and b) you’re in for a trip down nostalgia lane! About this particular coconut poke cake–I have tried and tested at least a handful of coconut cake recipes, but nothing compares to this moist, soaked, in-your-face coconutty cake. 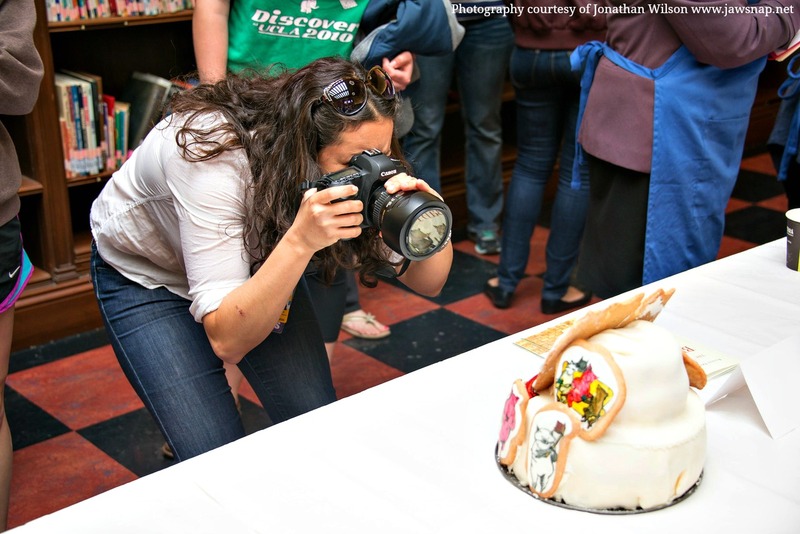 Still, I was wowed when this cake pulled its weight in the “Best Tasting” category….not to mention “The Best Student Entry” for the overall concept of this design. Wow! And the French Laundry cookbook and The Silver Spoon cookbook they sent home with me? Most definitely going to be put to really good use these next few months. Thank you to the awesome folks at the UCLA Library! (Psst, do you love coconut or know somebody who does? Make sure you stay tuned for the acclaimed coconut poke cake recipe when I post it next Sunday!). In the end, I was so glad I decided to come back to this festival for the third time. I’ll admit it, I almost didn’t enter this year–I had just returned from a major trip and had caught a bad cold, so I was definitely not feeling up for the 50-odd hours of intensive work that went into designing and baking this Calvin & Hobbes display–but Shannon, one of the wonderful librarians at the Clark, was so enthused about it that I got really stoked, too. And of course, I have to do something if I’m excited about it! It was such a blast explaining all of the creative process behind making my entry! Yeah, I saved that little gem for the end 😉 If you’ve ever read his work, you’ll know that he is an extremely accessible writer with amazing talent, and I definitely aspire to continue blogging, writing, eating, and creating because of his work. After I briefly mentioned him on Twitter, he even sent me an incredibly kind message of congrats for my work that day! Inspiration for the future? You betcha. And so that’s it! 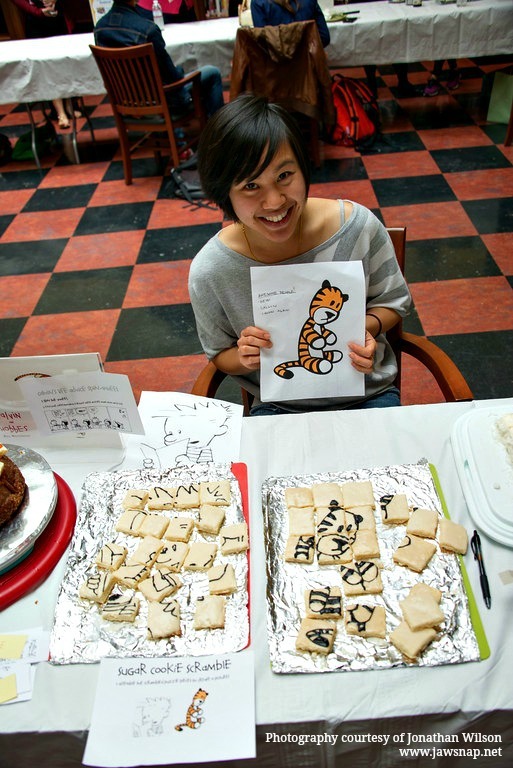 After an entire week of prep, dozens more weeks of creative designing and planning, and two fun-filled, excitement-packed hours of really putting my work on display, the 2014 Edible Books Festival has been another amazing success for the UCLA Library. 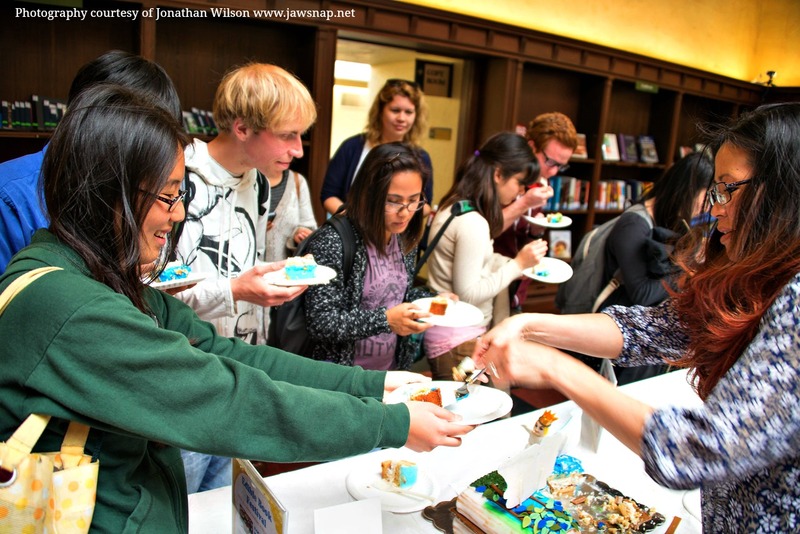 If you think your school or organization might be interested in hosting one, you can visit the official site for more details on how to organize your own Edible Book Festival next year. And don’t forget to subscribe or follow me on social media so that you can get the awesome (and now award-winning) recipe for coconut poke cake and Kahlua rum cake next Sunday! Quite a few participants who tried the cakes asked for the recipes in particular, so you’ll definitely see them up by next week. Here’s to another great year–thanks! 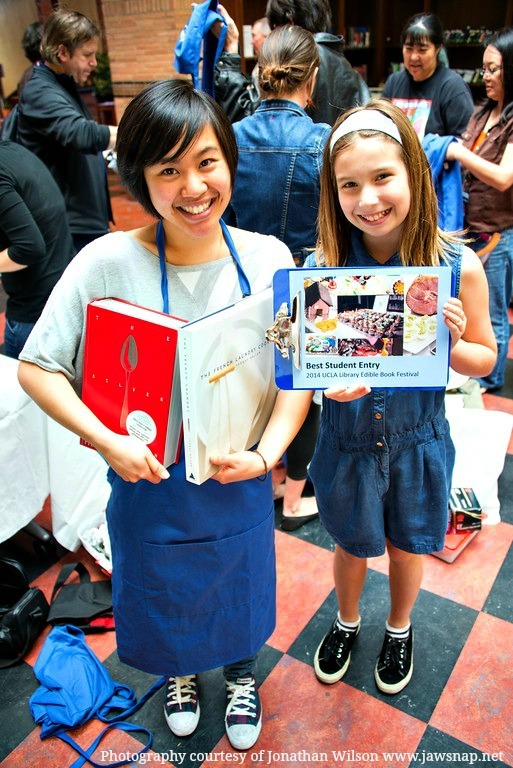 What cool book or design would you want to see at an Edible Book Festival? I’d love to hear your ideas–I’m sure they’ll be awesome! © Wallflour Girl. All images and content are copyright protected. Please do not use without prior permission. If you would like to republish this recipe, please link back to this post. I’m e-mailing this post to my brother! 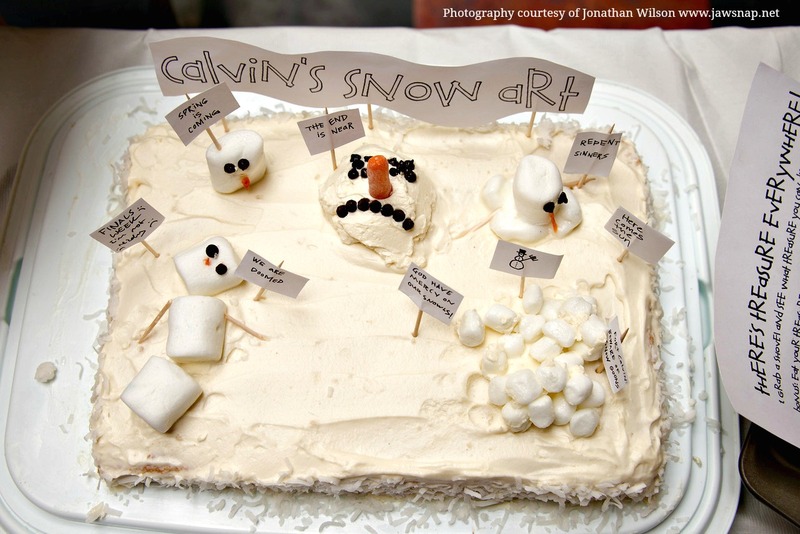 He loves cake and he loves Calvin & Hobbes! What could be better??? Congratulations on winning your awards! They were well-deserved. 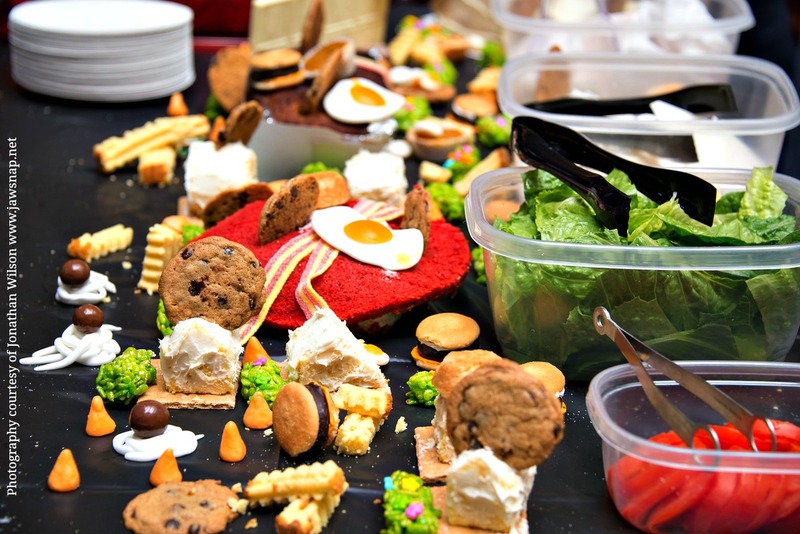 Those cakes and scrambles were very creative. Thanks so much, Edie! I’m glad you and your brother would be so excited about this event 😉 as it turns out, I asked my brother (also a C&H fan!) for thoughts about some of these exhibits–he really helped solidify some of my ideas. Thank you for taking the time to read and pass this along! Aw, you’re welcome! It’s nice to know that it was a sibling effort that resulted in those creative exhibits! My brother got a kick out of reading your blog and he said it was “cute” and he really appreciated it. Thanks so much for the work you do! How have I never heard of this before? 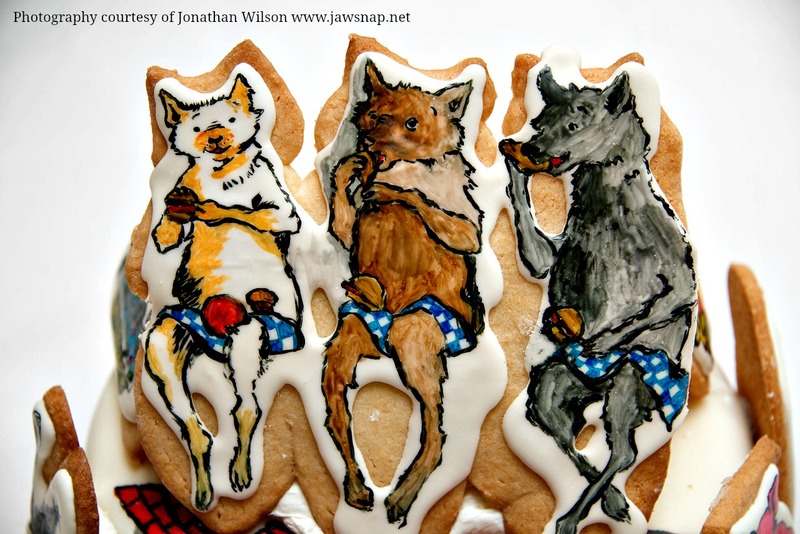 Books and baking combined into creative bites of tastiness? I am so there next year. I hadn’t heard about it before 2012 either, so no surprise there! But it really is the loveliest event, if you have a workplace or school that you think might be interested in starting one? And the coconut and rum cakes are *definitely* up there on my list, even to rival my favorite cookie recipes, so look forward to next week’s post about them! 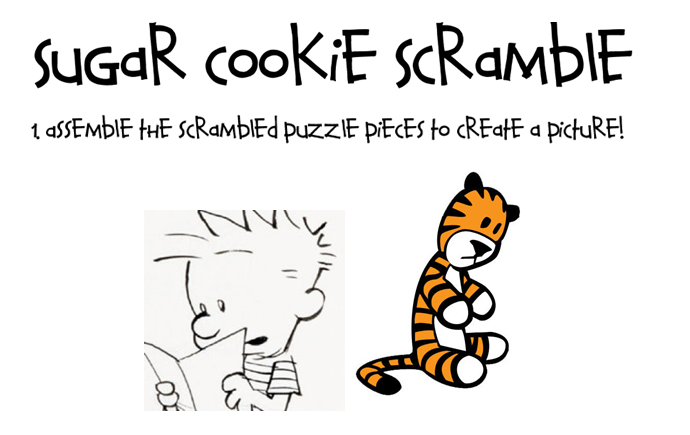 I’ll try and do a sugar cookie puzzle tutorial at some point, too, I bet your niece would love it 😉 any idea what cartoon you’d draw? 1. Print out an image and use a pencil to divide it into the number of squares/rectangles you want. 2. Bake sugar cookie in a giant slab, then cool completely and cut. You can adjust the # of squares as needed. You’ll want a nice sturdy recipe for the cookies. 3. Use a sugar cookie icing that will harden well. Brush on a layer of white icing and let harden. Whew! Maybe I really should just write that tutorial! Anyway, many steps but not too difficult. Hope this helps, Tifa! Thank you very much! That sounds completely doable. The layer of white icing probbaly makes the image appear neater and I can see why you cut the cookie sheets first. This is going to be fun. ^_^ I might have to try these before her next birthday…maybe I’ll do some for Easter or my mother’s birthday (its sooner). Ooh, this would be perfect for any holiday. Let me know how it turns out when you do try it–and it’s really just sooo much fun to do if nothing else. Good luck! Congrats! This is really cool! Very fun and interesting post — thanks. Thanks, John–it was a very fun experience, for sure! Omg the original C&H–isn’t that from the Homicidal Jungle Cat book? And what an incredibly small world! You should DEFINITELY come next year, I cannot praise this event enough. Thanks for the kind words, T.R.–and enjoy the Southern Cali weather today! Holy. Moly. You are SO creative!!!!!!!! My mind is just blown. The spinning cake?!?!?! LOVE THAT! And the puzzle cookies were adorable. The life advice. Omg. So much effort. So much creativity! You must have an absolutely fantastic English major–those literary allusions require quite a bit of creative thinking and all. I am SO JEALOUS that you guys have this! It literally looks like my dream. If I could make my own spread…oh man too many options. I just read The Impossible Lives of Greta Wells so maybe I’d do an interactive thing where people could spin a thing of cupcakes to see which era they would end up in…or I also recently read French Kids Eat Everything so maybe I’d do a vegetable-dessert themed spread! (Beet red velvet cake, carrot cake, zucchini bread, etc.). Okay I am seriously having too much fun with this. And that is SO exciting about meeting that famous food critic! I took a look at his top 100 restaurant list and I’ve only been to one (because I don’t eat out much in SoCal)…but it was a GREAT one. Baco Mercat, have you been? SUCH a great and memorable meal. PS. I didn’t know you lived in SoCal/went to UCLA!! (Wait. Are you at UCLA? I am only assuming here.) My uncle works there! And my extended fam lives in Manhattan Beach so I LOVE visiting! It’s one of my favorite spots evaa. Basically, this was a super fun post to read and you are amazing!!!!!!!!!! Baco Mercat…no, I haven’t been there but now I’ve bookmarked it! And haha yeah I’m at UCLA (I mentioned it because I was sending this article to the library to share, otherwise I generally like to keep location off the radar 😉 ) That’s so cool! So are you nearby too, or just your relatives? Where does your uncle work? Maybe I know him, heh. You should pay him a visit so we can knock off some of those Top 100 restaurants…Thank you again, Erika! Still blushing. Perfect Pudding Chocolate Chip Cookies–and My New Site!